Having the ability to administer antibiotics to sick pigs is critical in terms of not only animal welfare, but human emotion as well. That became abundantly clear in a recent a study on a pig farm owned by a Minnesota company. Pig farmers know the importance of being able to use antibiotics when the need is justified, but the public may not understand how the lack of antibiotics creates suffering for animals and humans. While not the original intent of a study designed to look at how porcine reproductive and respiratory syndrome (PRRS)-challenged pigs performed in swine production systems that don’t use antibiotics, researchers learned a valuable lesson about animals and those who care for them. 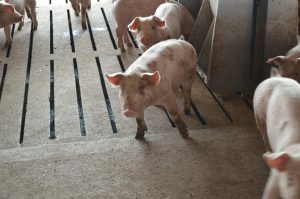 Conducted at Pipestone Veterinary Services facilities, the study required a small subset of pigs to be challenged with the PRRS virus, considered the costliest swine disease in the pork industry. Researchers followed the animals as the virus went through the group. All animals except those in the small subset were treated with antibiotics and subsequently recovered. However, because the negative response by this small subset of antibiotic-free pigs was so drastic, project leaders stopped the study and treated the sick animals with antibiotics. Those who work with pigs want them to grow and do well. Not being allowed to treat the sick pigs in the study was a human challenge with emotional consequences. The people taking care of them showed emotional distress. The struggling pigs recovered once antibiotics were administered and as they did, the mood of the caregivers seemed to recover and lighten as well. The study was designed to compare the performance of health-challenged pigs from birth to market in an antibiotic-free group with two groups that received both injectable and oral antibiotics as needed. The PPRS virus poses a major threat to any swine herd, but it’s particularly costly when pigs are raised without antibiotics. The virus knocks out a pig’s immune system and “opens the door for secondary pathogens to cause problems,” Dee said. Many consumers today pay close attention to labels on packages and don’t want to consume products from animals that were treated with antibiotics. Dee says the aborted study has given him a different perspective on food and labels. PRRS is estimated to have a $664 million annual impact on the U.S. pork industry.